Sometimes when we make our boards things don't go quite as planned, parts are soldered on incorrectly, firmware becomes corrupted beyond recovery, or something simply doesn't pass our quality control guidelines. These Ding and Dent Production Builds are the result of these errors. Though these boards may be our failures we also understand that one person's trash can be another's treasure, therefore we are passing these boards onto you at a drastically cheap price. Think of these Ding and Dent boards as a mini Dumpster Dive, you don't know what you'll get and neither do we until they are pulled to ship your order. One quantity equals one board. You may get something as small as a LilyPad Button Switch or something as big as a Digital Sandbox, who knows! One thing is for sure, though, all of it is guaranteed not to work! Note: These Ding and Dent Production Builds are a gamble. You will get ONE board. What size you get is just the luck of the draw. If you are looking for fully functioning, well documented goods, we would advise against getting this ding and dent product. GPS is great, but after i reach like 25 boards its starting to get ridiculous. Why buy lottery tickets when you have SarkFun Ding and dents?! Oh, for the love! No! As tinkerers we are all predisposed toward hoarding. The last thing we need is to be buying stuff WE KNOW DOESN'T WORK. Life is too short. DON'T DO IT!!! Sidenote: Over the holidays I went to visit my Dad at his home for the first time in ~10 years. After seeing his collection of projects in progress. I opened a browser and showed him 31 items I had sitting in my Sparkfun cart. He had 28 of those items in quantities of 8-24 each! My cart had 1 of each item in it and was over $100. He insisted I went home with 4 of each item. Now I'm the hoarder. Got everything working except the 2 Edison blocks with misplaced mezzanine connectors, which are near impossible to hand rework. Also could SparkFun try to put a variety in orders with multiples of this? Last time I spent over $50 only to get 10 of the exact same microphone board. one of the reasons we went to the "all in one" SKU was to stop that from happening. Before, when we added stock, chances were that it was all a single build, and it was all the same thing. Since it was split between types, it almost always meant that it was the same thing that got added. But with everything combined, ALL builds go into the same box. And we're always building about a dozen or so products, so when stock gets added, it will most likely be a mix. Check the video Friday, you can see what's in the box, it's a large assortment of stuff. You shouldn't be getting the same thing if you buy multiples. Of course, no promises though. Yeah... I ordered 5, and got 4 identical 7-segment serial LED driver boards. So... not quite there on variety. On the other hand, the other thing on the order was 2 of the 4-digit 7-seg displays that go with them. So... maybe that was on purpose? That's nice if that's the case, but still... 4? Maybe they gave you 4 figuring you might end up with 2 working ones. This is now my favorite story on the internet. Woot for 3,000 stock count at $2.95 each!!!! Ordered 3 pieces and got 2 redboards and 1 ioio otg board. The first redboard has all components but I see two wrong resistor value's. The second redboard does not contain all the components. The IOIO otg board, I still have no idea what is wrong with this. I got a usb breakout and a WAV Trigger - sweet! I ordered 3 and got a fully functioning(as far as I can tell from a few minutes of testing) microview without the case, another microview that I haven't been able to get working yet with the case and a triple axis accelerometer which I haven't tested yet. So i got my order. i got.... 4 serial 7 segment display boards 1 IOIOOTG board 1 ProMiocro 1 Mini Arduino Pro 1 Sunny Buddy 1 lilypad arduino 1 Microview board. I'm in for 10, hopefully I don't get the same 10 things like Tech Geek did! Getting ten of the same thing increases the chances that you'll be able to cobble them together and make one of them fully functional. Sure, it's possible all those microphone boards all had the same defect, but otherwise I'd prefer multiple copies of the same board, as it'd give me the greatest chance of being able to make something work. These are really fun to recieve and then try and guess why they were rejected. Some were simply for glue stuck to the board! By far the most annoying board type to receive are the Intel edison boards though.. non-standard connector type makes them nearly useless as they are very niche. They accounted for about half of my last order.. Still good stuff but if I want to make anything meaningful with these boards I have to buy an edison also. All the arduino type stuff features 0.1" headers so it's flexible at least. Sorry. There is no telling what we’ll have in the bin when these are in stock. We have had much better Edison runs lately, so you should see less and less Edison stuff in the future. Those tiny connectors can sure cause some trouble in production. I got an Arduino Pro Micro (5V) whose only problem seemes to be that USB 5V isn't directly connected to Vcc as it should be. Not a problem though since I have plenty of little power supplies lying around. I ran through the tutorial, and after updating my Arduino IDE, the boards library, and accidentally bricking the board once by not changing from the auto-selected 3.3V processor to the 5V processor I finally got it blinking its Tx/Rx LEDs. I definitely lucked out! I have fixed 1 out of 5 boards so far. But pretty busy at work so I have to let it be for a bit. I will sneak another one in and out and hopefully to yield more boards just to play. Expand knowledge, you are never too old.. Being 66.. I ordered 10, got 9 Edison boards and 1 mini Arduino board. I don't have an Edison to test against to find issues, the mini Arduino just looks like it has a faulty LED, thus far it seems to work fine. Just need to up my luck attribute before I order again, see if I can't get something I can actually troubleshoot and the like. FIVE STARS. (c; Already fixed a couple items. Fun times! Hi, I'm sorry to see this. You're right, that is not a fair DD product. We will be sending you new DD boards, and be removing any more of these LEDs from the bin to avoid future issues like this. I too received 4 LilyPads with my quantity of 4 ordered Ding and Dents. I understand its gambling but these to me should not qualify as production circuit boards since its really just an LED that sell in packs of 5 for $3.95 working. Very disappointed. Super Bang for the Buck! There were only minor fixes to be had on most of the boards (ignoring the one board with ripped bads). All these little guys needed was a bit of tender love and care. I ordered 3 boards and got 100$ of stuff for 6$ They needed minor fixing but all ended up working great! Ding and Denter For Life! For the price of the board, you're almost guaranteed to find a part or two on it well worth the investment. You ever play a slot machine. I bought four of these to hedge my bet. One of them is an Arduino Lilypad. It comes in a square PCB with four LEDs and one buzzer. It has some test points for a power supply so I hooked up 5 volts to it and it booted up and ran a little test sequence. I guess when they make the boards they save time by loading a test sketch that blinks each LED and sounds the buzzer. One of the LEDs is chipped and doesn't work. At first glance the main board seems fully functional and the buzzer works. I have not tried to reprogram it yet since I don't have an FTDI adapter. The production PCB contains three products. Note: the production PCBs come with 4 of these LEDs. Upon inspection I found what may be a solder bridge on one of the usb connectors. They are very tiny and hard to make out with the naked eye. Yet with a magnifying glass and a soldering iron + pencil tip I maybe able to bring it back to life. The next one is the IOIO-OTG. It seems ok to the naked eye and it boots up ok. I even connected it to my laptop and got the version number from the firmware. Putting it into bootloader mode seems to have issues. I'm not sure on this one as I didn't take it any further. The 7 segment display is not included, of course but I'm not quite sure what's wrong with this one. The board looks okay but I have not powered it up yet. I got a Transceiver breakout board, a capacitive touch sensor breakout board, a TMP102 temp sensor breakout board, a RTC module and a microview board with small screen. The transceiver I can't fix because it's missing the transceiver chip. The other boards I will try to repair but I don't see anything obviously wrong with them. All of this for under $20 Canadian with the economy shipping option. Update: I have been fairly busy with work so I am still hoping to find some spare time to tinker with these. Also I have some parts that I am waiting for to help with these projects. I've ordered a total of about 20 boards (over about 2 months), and I've been pretty happy with what I got! 2x Arduino Pro Micro - One worked fine out of the box, the other had a solder bridge on its microUSB connector, and worked fine after that was fixed. 4x Serial 7-Segment Display boards (without the 7-segment displays) - I haven't been able to get these working, and I have no idea what's wrong with them. 1x MPU-9150 - Doesn't work over I2C, but I haven't tried other protocols yet. Overall, I'm happy with what I got, and I've had fun and learned a lot trying to fix the boards. I put 10 d&d items in my cart. I received 3x the exact same PCB: a uart block. The other items were: A console block (very similar to the uart block), an arduino block, an I2C breakout block, two arduino nano-type boards and the blackberry trackballer board. So overall, I'm really not satisfied with this purchase as I received similar items, and there is nothing of value here. Sparkfun (over-)charges a lot of money for the UART blocks ($25) but there is nothing of value on the board. It's just two connectors, a power converter and some kind of interface chip. Six of my items are for the intel Edison so not the variation in stuff I was hoping for. Will not buy again. I wish I had realized that I would need some kind of hot-air rework setup in order to disassemble these boards. I just didn't do enough research into the process before ordering these. However, the boards I got have made me excited to learn more and maybe try to make these boards work, because I got some good ones! I ordered two items from this, I got a S7S (serial 7 segment display) with the only issue being a scraped VCC line on the back. The other thing was a RFM69HCW 915MHz transceiver with a sheared off capacitor (I have a spare same value but electrolitic not SMD). I have already verified that the S7S works. 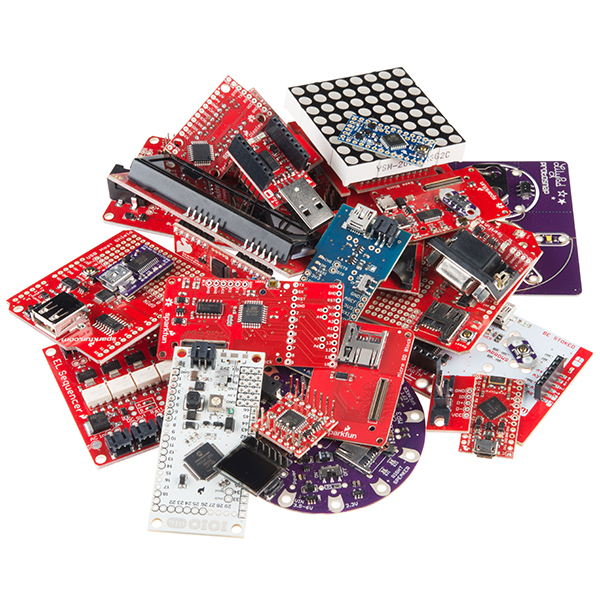 No idea what I'm going to do with only one transceiver though..
Sparkfun, it's one month too late for April Fools. After reading the rave (and not so rave) reviews, and Sparkfun response to the Edison complaints, I ordered up 7 D&D production builds immediately after they became available and used a $10-off coupon. Total was $16.12, including shipping. Yes, these are the modules that usually come in working packs of five for $3.95. It appears that the modules with LEDs were rejected because of improper placement of the LEDs on the board. I have not tested them. In the first place this is what I find to be very smart of SparkFun to give away these broken/improperly made for a good price. This equals less waste and happy customers. I lucked out because I got a SparkFun Venus GPS with SMA Connector, a $49.99 price, and out of stock at time I made this review. The one flaw with it is that the SMA connecter was not on the board, so not a very big issue(I hope) This being my first purchase from SparkFun I am very happy right now. I'm still hoping to find a good use for the little guy. I got my second order of ding and dents today. The first order was decent. This order, one of the boards was a Sparkfun QRE1113 Analog Line Sensor, which is listed as $2.95 new. This is the same as the ding and dent price. Sometimes better then others, but at a minimum it's very interesting to look over boards I wouldn't have otherwise bought. It's like being able to see behind the curtain and see what can go wrong during manufacturing. I have to say I'm impressed with SparkFun's quality control and it's a blast trying to puzzle out why a board was Ding'ed. This is also an interesting way to learn component level trouble shooting. Sometimes it pays off when I'm able to fix, repair or repurpose a boards components. And if you have been looking for an excuse to buy a stereo microscope and/or a hot air rework station, this is it. Great deal - need some luck though. My only complaint with these are that you guys don't have more of them! :) I bought two of them a few months ago, and got a Digital Sandbox and a FreeSoC2. I easily fixed the Digital Sandbox- the battery switch was missing, and I happened to have a replacement with a similar footprint, and the FreeSoC2 is missing the resistor for the user LED and a usb port. 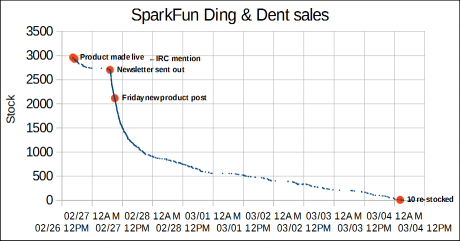 Sparkfun has seemed to improve on the value, based on some of the other reviews. Can't wait for my new batch to finish shipping! And finally one mystery board I hope someone at Sparkfun can shed some light on, a PIC24 breakout board that instead has a cy8c29466 PSoC on it, miswired. Hopefully I can get some working, as these are all interesting boards that look fun to play with. mine's was just a ding & dent pcbs without components, looks like i will be soldering the components into these pcbs once i figure out what were their for... it's going to be one of the most difficult puzzles i will have to figure out... (5-10-16) turns out i actually obtained 1 FreeSoC2 dev board, 20 in 1 openlog pcbs, 3 in 1 led matrix controller pcbs. all blank, but ok. maybe i keep... cuz it looks like i struck gold. they r dings & dents just no components on them or solder. just clarifying... to get rid of this confusion, i will show what i got in youtube, channel Gio Ex. to prove what i got. Sorry about that, it looks like we sent you the wrong part. Someone will be in contact with your today. EDIT: After contacting customer service, I was sent out replacement pieces (I was sent scrap boards instead of scrap projects), I'm stoked with the purchase. Glad to see Sparkfun will work with their customers. Hi, I'm not sure who you spoke with, but I have hand selected some nice replacements for you. They are going out to you today. Sorry for the mix up with who ever you spoke with. I received a Tiny Programmer (worth $19) and the only thing broken on it was some miss-soldered headers. Other than that it works a charm! Dont think buying more will better your chances. I know this is supposed to be a gamble, but by buying 5 I thought there would at least be some variety, based on other comments I read. I got one time of Flight Range finder which is pretty cool and 4 Level converters... Id have been happy with 4 different boards that were less expensive new than i paid for them broken but 4 the same? I apologize for the inconvenience this has caused you. We will work on a solution with you privately. Thank you for your patience. Best lottery + soldering practice ever! I originally got these because I thought they would be great practice for my new reflow station, but unfortunately my 12 bucks turned out to be worth more than 50 bucks, and I became obsessed with making them work. Still haven't fixed all of them, but hell if you feel like exercising your engineering skills buy some of these, you'll get something of worth in more than one way. Feel like I got a little lucky. Got a micro OLED that worked just fine (over i2c at least) once I cleaned up some soldering on the flex cable, boom! Worked great with the linked library. Ordered two, other is an arduino pro micro - the only thing that seemed wrong with it was the pin 13 led was busted - granted, all i did to test was upoad blink example which worked on pin 2 with external LED. Anway. either product was well worth my six bucks! My 5 boards arrived this afternoon, and already I have managed to bodge one RedBoard back into a functional state with a 1N4004 wedged between two components.. I got a Lilypad AAA 5v step-up power supply, a line follower, and a LCD backpack with display. The power supply just seems to have botched it's plating process, as the four through-holes look like bare PCB. I clipped in my desktop PSU with 1.5v and all the pads seem to work and output just a hair below 5v. Plating issues are fine with me! I'm not sure what is wrong with the line follower. All I've tried to do is apply 5v to the headers and I didn't see anything light up. This is a pretty special purpose item, so until I actually want to do a robot build this will just sit and I'll have to diagnose more later. The display seems to have old firmware I'm suspecting. I can talk to it with by RedBoard (https://learn.sparkfun.com/tutorials/serial-graphic-lcd-hookup/#example-2---arduino) but it seems to be offset by 3 characters. If I send it "hello" it displays "he" and then if I send it "again" I see a grand total now of "hello ag". It displays three less characters than it knows it has it seems. Also, the top portion of the board is chopped funny so as to have the mounting holes cut off. Funnily enough, even the product picture shows this as well. Seems as if their "good" product might just be flashed with the new firmware? Unsure exactly. Flashing the firmware on a MAC is not that straightforward. (https://learn.sparkfun.com/tutorials/serial-graphic-lcd-hookup/#troubleshooting-) I'll give the tut another try after I dig out my windows machine and boot it up. Best Ding and Dent EVER! I ordered 10 of these on the almost free day. Here's what I got : Lipo Charger Basic, which seems fine, but don't have a battery to test it ($8 value) A lily pad power supply that is missing it's on off switch, but everything else seems fine. ($15) SparkFun Triple Axis Magnetometer Breakout - HMC5883L seems okay, but haven't test it ($15) SparkFun ESP8266 Thing - Dev Board ($16) An E-sewing kit with one corner of the battery holder knocked off, but it's still useable, and has 5 leds, a button, and a power switch. ($18) A redstick that will program, but is missing the onboard LED for 13. ($25) SparkFun ToF Range Finder Sensor - VL6180 looks fine, but haven't tested yet, ($25) SparkFun XBee Explorer USB again, looks fine, but can't test, no xbee stuff ($25) SparkFun Venus GPS with SMA Connector looks fine, but again, can't really test it until I get an antenna to work with it and hook it up to a controller. ($50) ANd finally, a Purpletooth Jamboree, . It has a small crack/burn mark on the bottom of the board right under the bluetooth. I was worried, but it connected to bluetooth just fine. I'll have to tinker some and hook up speakers and everything to see if it works 100%, but another $50. But if everything gets to work, that's $246 worth of stuff for $30. But remember, YMMV. I have had other times where I just got a couple of interesting things and most where cracked and didn't work. But for $30, it's worth a shot. I got a perfectly working lilypad power supply and a lilypad simblee that i can't test in my one order. great buy! edit (2016/08/22): thank you to Sparkfun's excellent support staff per the comment below! Much appreciated! orig: i expected something dysfunctional, but hoping for something i could repair or cannibalize. instead i received two FreeSOC2 blank circuit boards which probably should have gone into scrap boards category. still gave it a 4 and will roll the dice in the future! Hmmm, definitely sounds like your stuff was picked from the wrong bin. I'm going to take care of it for you. First off, I'm new to the Dings and Dents, so I'll ask a little question : is it normal to receive a single board ? (i'm not angry, the one I received is a super bang for the buck, repaired easylly ;)). If it is, superb concept ! Glad you're happy with the board. Yes, as it says in the description, you roll the dice, you get one board. Have fun with it! I ordered 10 of these, along with 10 scrap boards as I wanted to practice soldering and SMT work with my new hot air rework station. I was disappointing that 4 out of the 10 were just boards with solder, no components. Nevertheless, I'm still happy with the purchase, and will probably pick up a few with each SparkFun order I do. I bought 5 hoping to have some fun trouble shooting and repairing/tossing them if they were to far gone. Got excited when I saw the red box in the mail. Opened it up to find 3 of the five boards were blank. I guess the guarantee of "not to work!" was true but i at least thought the boards would have parts on it to actually not work especially since the photo only includes finished boards. The 3 boards were "dinged and dented" meaning they had missing pads and deep scratches cutting the traces making them entirely useless. In short Dont buy unless you need un-usable red fiber board to throw away. Before I purchased, I saw several reviews where the customers received D&D boards at a value less than new boards, and that their customer service had taken steps to improve this product by removing LEDs. I had high hopes that meant the value of the D&D would be above the price of a new board. If this was a grab-bag product, where your board is functioning, and Sparkfun provides customer support for it, I would understand them selling boards valued at the same price. I ordered 4 ding and dent items and three of them are https://www.sparkfun.com/products/12009 that are the same price for known working units. 3 probable bad boards for the same price as known good ones. If I had needed logic level converters, I would have ordered known good ones. Not really right to put them in the dent and digs at the same price. If stuff like this was part of a dent and ding that was about $0.50 each, I would take the shot knowing they were not expensive items in that group. Bought three of these, got scammed. Was sent corroded BOB-12009 level shifters which are this price brand new! Also an unpopulated, unusable and utterly worthless Arduino pro mini pcb. Seriously? I mean look at all the cool stuff in the pictures. I would have been happy with just one slightly interesting board in the lot for tinkering or salvage but I got all worthless junk, all three. Poor effort Sparkfun. Three strikes, you're out! Don't buy this trash. I bought 4 of these. Got a sound detector (haven't tested yet), a 6A DC to DC Converter (which immediately started smoking without anything connected to VOUT), a microSD Edison board, and, the crÃ¨me de la crÃ¨me, a perfectly working SAMD21 Mini board. That board alone paid for more than the entire order. Honestly, even if nothing worked, just the fun of getting the boards, troubleshooting, attempting to fix, etc... was worth the cost. If you're not into that kind of research and tinkering, I wouldn't bother. I imagine that getting a fully working Arduino-compatible board is fairly rare. I was able to scavenge parts from the stuff I couldn't use (DC converter, Edison add-on) and had fun doing it. Sometimes you roll snake-eyes! I have had very good luck with Ding and Dent and Dumpster Dives in the past, but this time I got nine Edison Blocks (not into that yet) and one serial seven-segment board (which I can use). Will I try again? -- Probably -- my good luck may return, and fixing and repurposing is fun. Sorry you couldn't make use of the blocks. The ding and dents are a gamble, and there is no telling what we'll have in the bin when they are in stock. But sometimes rolling the dice can really pay off. Happy hacking.